So I’ve just had the most delicious strawberries I’ve had in a while. These are the usual Korean variety that can be easily bought at the supermarket. While eating these strawberries, I suddenly remembered my recent visit to Meidi-ya. This Japanese supermarket located at Liang Court Shopping Centre in Singapore has a section dedicated to fruits that are flown in from Japan. And the prizes are crazy expensive. 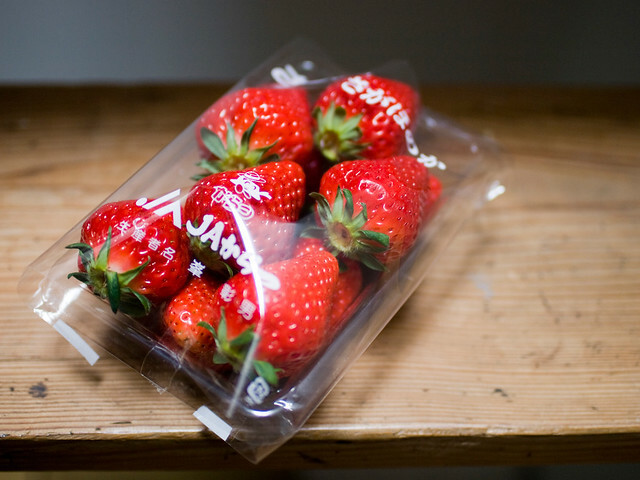 For starters, a box of Honoka strawberries from Saga would set you back by S$29. Still affordable to some but definitely not the cheapest strawberries you can find. Then there are the more premium variety of fruits that are meant as gifts. The decopon, a seedless and very sweet citrus hybrid fruit, is packed in a simple white gift box. Half a dozen goes for S$79. Ouch. Finally, there’s the infamous muskmelon from Shizuoka. With a hefty price tag ranging from S$79 to S$139 each, these ultra premium melons are usually bought as gift fruits to impress business associates or the in-laws. Boy, would it not be a terrible shame if the recipient didn’t know the market price? Anyone who calls the durian the king of fruits obviously hasn’t seen this melon. Unlike the decopon, this one doesn’t come in any form of gift wrapping, just the usual shrink wrap. You would think they could have placed it in a wooden box with cushioning and fancy Japanese calligraphy. The result was a ridiculously sweet, juicy, and tender melon – so tender that a spoon basically went through it like a hot knife through butter. It was all about quality – notice how the shape of the melon was perfectly round. This bad boy yielded about ten slices, making it about US$5.50 a slice, or perhaps even US$2 a bite. Here’s another interesting read that may partially explain the astronomical prices behind these fruits. No, I didn’t buy any of the fruits. I can’t justify spending that amount on a mere fruit, can you? A nice restaurant meal would almost certainly bring a better savoury and sensory experience. But if you have ever tasted these expensive fruits, feel free to brag about it in the comments section. Would you buy these expensive fruits from Japan? Sure! I'd love to find out how they taste. Yes, but only as a gift for someone. Have you ever bought or eaten these expensive fruits? Share all your thoughts via Facebook or Twitter or by leaving a comment! I wish I could sell and get half of what there getting. I grow them every year. Those fruits would make one big expensive fruit salad! Maybe we can get directly from Japan.. Do you think there’s market in Singapore ?